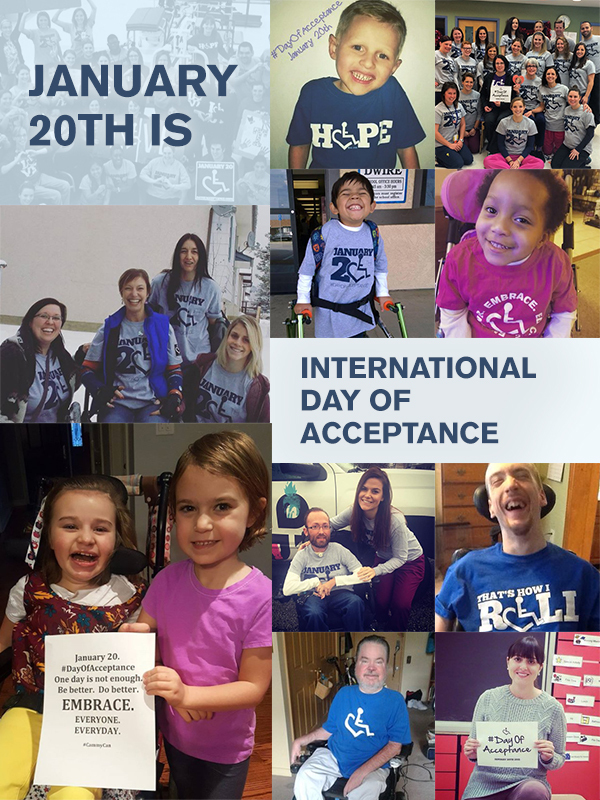 The International Day of Acceptance is a day dedicated to social acceptance of disability and to honor the late Annie Hopkins, founder of 3E Love and creator of the International Symbol of Acceptance. Embrace. Educate. Empower. Love Life. Friends, tell the world you embrace who you are; a person with social rights, who has an opinion, who has interests, who has goals, who loves life, and who will not be without a voice in society. 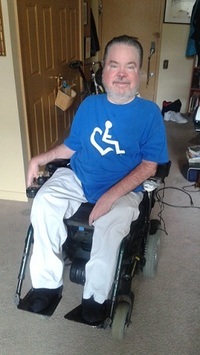 You are not living disabled, you are living. 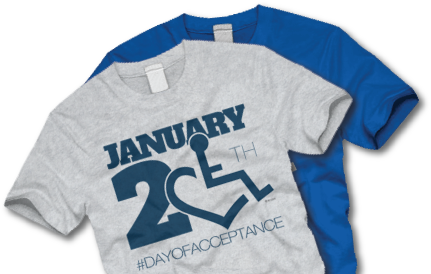 Supporters, join us in telling the world that you are accepting of people with disabilities – you also have a role in our culture and life. You can have an impact on the future by wearing your heart on your sleeve and proudly demonstrating acceptance. 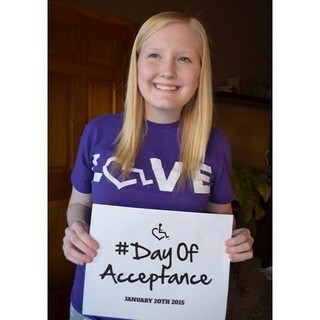 Post a #DayOfAcceptance photo and tell your friends what acceptance means to you. 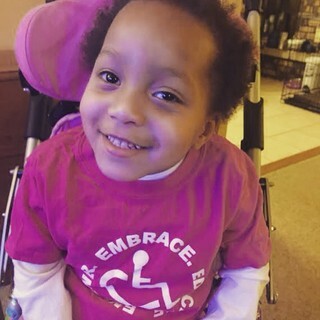 Print our hashtag sign at this link or wear your favorite 3E Love tee. I am more than adequate and suitable for what I want to do or be in life. Self acceptance is being loving and happy with who you are now. It’s an agreement with yourself to appreciate, validate, accept, and support who you are at this moment. Now, if everyone else in this world would see what I see in myself, the world would be a better place, not just for me, but them as well. Strength, peace and serenity are available when one stops struggling to resist, or hang on tightly to what is so in any given moment. 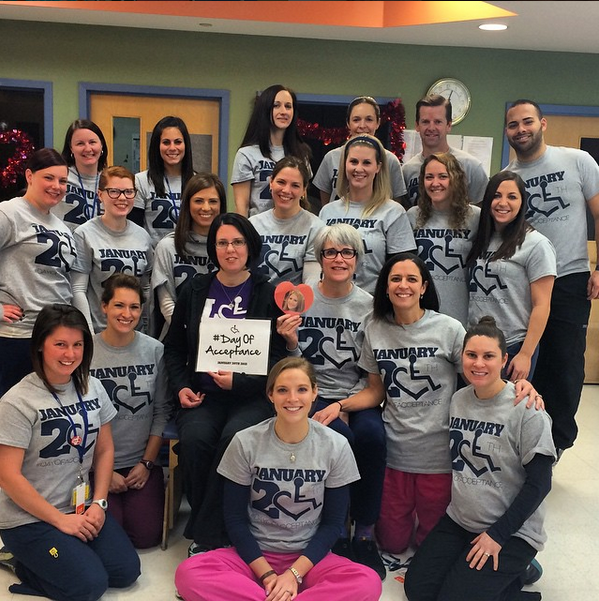 I celebrate acceptance because I live with SMA. It does not define me. It does not stop me. I am determined. I am funny. I am loved! Riley Elizabeth Crum was born February 15th 2014. She is the sweetest baby girl you will ever meet. My wife and I have several nick names for her but our favorite is "Smiley Riley". She will melt your heart when she smiles. For Faith (My wife) and I, life gained new meaning the day Riley was born. 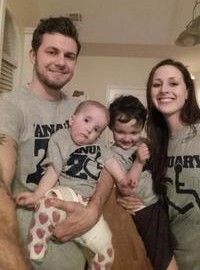 To our family, acceptance means live every day to the fullest.  Love each other, Love life, don't let a diagnosis, a category you or someone else has put you in, or something someone has told you shape you and determine your abilities. 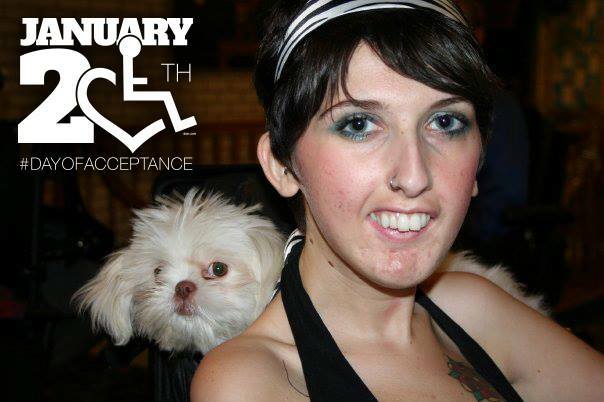 Acceptance means seeing lots of disabled folks who look like me in TV shows and movies. No more Brad Pitt playing Stephen Hawking. Why not Stephen Hawking playing Stephen Hawking? Or, better yet, why not Stephen Hawking playing Brad Pitt? We're getting somewhere when we routinely see genuine, honest-to-God disabled folks appearing in our mass media, warts and all. 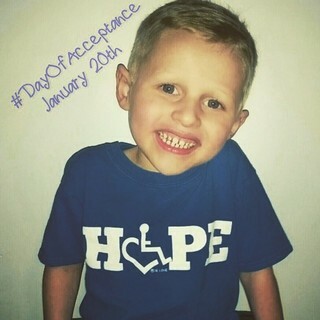 January 20th is International Day of Acceptance. 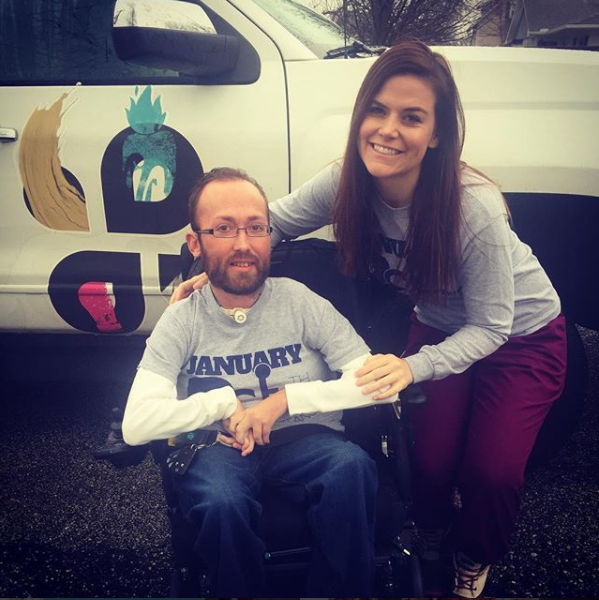 Today I celebrate this guy and what 3E Love stands for: embracing diversity, educating your community, empowering one another, and loving life. There is no denying the world we live in is filled with destruction, hate, and negativity, but I believe we have the opportunity to make the world more positive and to view things in a different light. We all have challenges we go through in life, some challenges may be alike others completely different. The way we deal with these challenges is a true testament of our character. I would like to express how in awe I am of this man. He defies all odds, meets every challenge head-on, and pushes against the boundaries set against him. Whenever he meets an obstacle that would give him good reason to give in, he does not break. He pursues his dreams, runs the business he started, and lives his life to the fullest. Every day he chooses to love life. 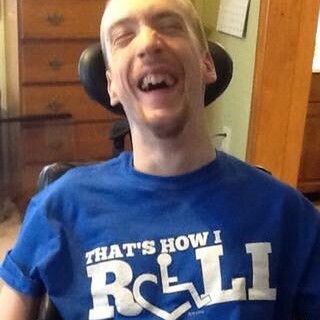 Not everyone is as strong-willed as Travis, and for this reason I hope that the stigma surrounding disabilities will eventually be a thing of the past. 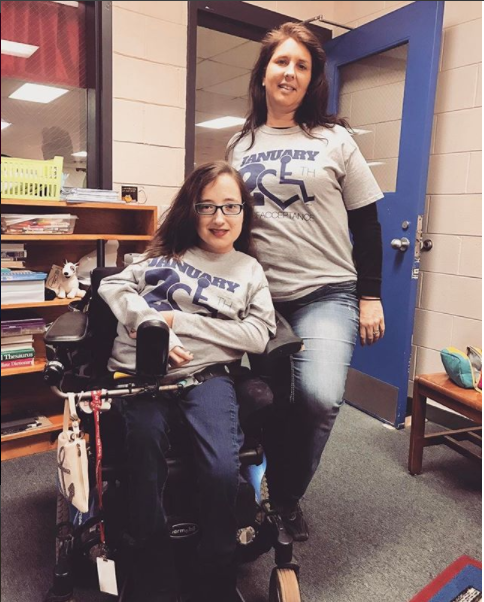 I hope you choose to celebrate your life, to recognize a person’s abilities rather than their disabilities, and strive to make the world a more positive place for everyone in it. I'm so incredibly blessed to have people in my life who love & accept me wholeheartedly. God only knows where I'd be without them, especially my Mom. Living life with a disability is not easy & I wouldn't wish it on anyone. There are days I struggle to even accept myself. 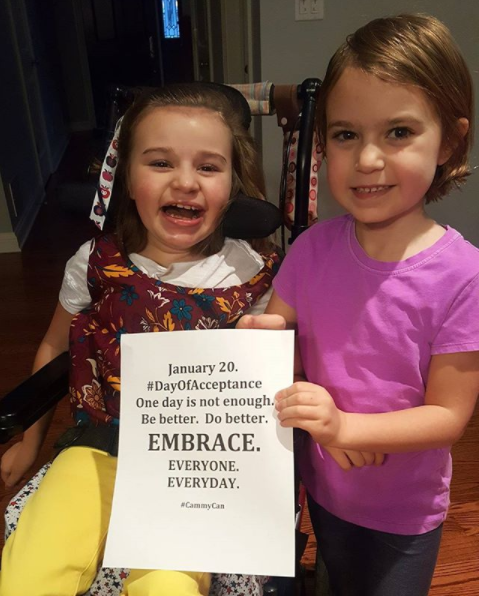 My hope is for all disabilities to be accepted. My disability does not define who I am. And I refuse to let it.